Gardening season is coming to an end. I have picked off the remainder of my free tomatoes and free peppers, as well as basil leaves and chives, and created a quick and simple meal out of my fresh veggies. Nothing can be simpler than some pasta and stir-fry veggies, so that is what I decided to prepare. 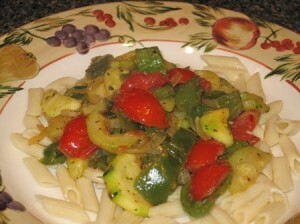 You may like to sprinkle some Parmesan cheese on top of the veggies, and serve it with warm garlic bread. Cook your favorite pasta per package directions (one cup of uncooked pasta should be enough for this recipe). Wash your veggies, and dry off on a paper towel. Cut up your veggies (cut peppers in half, remove stems and seeds). Heat up a frying pan with the olive oil. Add onions, and cook until translucent looking. Add peppers and zucchini, and cook 3 minutes. Add tomatoes, and cook another minute. Add chopped basil, minced garlic, chives, salt and pepper. Fold in a little bit of olive oil into your pasta, so it does not stick. Place pasta on a serving platter, or individual plates, and top off with veggies. You may like to sprinkle some Parmesan cheese on top of the veggies, and serve it with garlic bread.